One of my mother’s specialties I can remember while growing up was her homemade pizza. At the time, I was stubborn about it primarily because she used some sort of whole spice in her crust that I always hated to eat. Needless to say, I loved the concept of homemade pizza. Pizza is so easy to make! After my discovery of homemade pizza, I made (and still do make) pizza a lot. I think we eat pizza once a week. This week, I had enough. I still wanted the bread, cheese, veggies, and sauce but I was tired of the same old boring pizza. So, I made something that I love to eat but rarely ever get- a calzone. Usually when you order calzones in a restaurant you feel as though they have managed to stuff an entire pizza in one calzone. This is a much more manageable (and if I do say so, delicious) alternative. Once yest is ready, add oil, salt, the whole wheat flour. Begin to knead with dough hook, adding the rest of the white flour as needed until the dough pulls away from the side of the bowl (dough should still be kind of soft, just not sticky.) Continue to knead for 10 minutes. Once done kneading, spray lightly with oil and set in a warm spot and spritz with water. (I usually turn my oven on to 200˚ and then turn off to use as proofer) Let dough rise until doubled in size-I usually go 30-45 minutes for pizza dough. Turn out dough onto a floured surface. Roll out into a rectangle (sizes will vary) and continue to roll until your dough is about 1/4″ thick. Cut dough into four rectangles. Place a spoonful of sauce, followed by veggies, and then cheese in the middle of the rectangle. Fold over and pinch the ends together,making sure the calzone seals. Repeat with remaining three. Place on a parchment covered tray, rub with olive oil, sprinkle with oregano, and cut three slits in the top. Bake for 25-30 minutes until calzone is golden brown and you can see the cheese bubbling. Looks excellent. I think I’ll try making a similar dough in my bread machine (blasphemy?) on the “dough” setting, just to cut down on manual labor time. Also: I wonder how these would survive a refrigerator/freezer trip? It would be great to make a weeks’ worth of lunches on one day! I left mine in the refrigerator for a day (before baking) and they were fine. I had also thought about freezing but the calzones didn’t last that long… If you bake them all in one day, I would probably freeze and then heat re-heat. THIS. IS. AWESOME. I want to eat this right now! 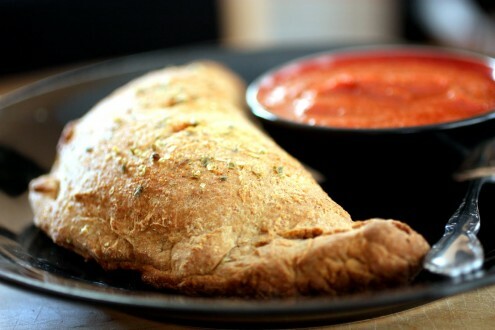 i love calzones!! yours look amazing. YUM, this sounds delicious and so satisfying! I think I will be making these for dinner sometime next week-I love that they’re vegetarian! Do you know how many calories a serving? Made your dough with my own fillings…. fabulous! The dough is perfect! I was skeptical about it feeding 4 people but it sure rises! Mom and I both had one and we are going to freeze the other two 🙂 thanks for a great recipe! Made this for dinner tonight. Doubled recipe for my large family. I didn’t double the sugar though and the dough came out fine. Also you didn’t specify what to do with the Garlic, basil and oregano so I added some to the dough but much less than the Tbls called for. I also saute my veggies: fresh garlic, onions and yellow bell peppers in olive oil before adding to the calzone. These were very yummy. The whole family enjoyed them. Thanks for sharing. Calzones are my jam! Love them better than pizza and I love pizza.